use eventually ends up in the ocean. The plastic pollutes the ecosystem and takes thousands of years to decompose. See more plastic in the ocean facts below. Ocean currents have created several gigantic “plastic soups” around the world. No-one knows the size of these, but they could cover up to 16 million km2, or the combined size of Europe, India and Mexico! The plastic soup has been growing 10 times in size every decade since the 1950s. If nothing is done now, this problem will spin completely out of control. Fish and shellfish contain toxic chemicals at concentrations as high as nine million times (!) those found in the water in which they swim. Notice all the plastic around you, the plastic bags you use, and change to biodegradable alternatives. They exist! And take a look at the video below of the plastic soup in the Pacific Ocean. 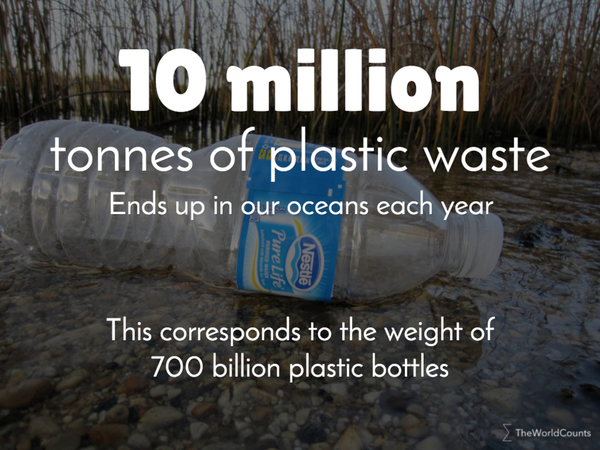 About 10 million tons of plastic is estimated to end up in the oceans every year. The exact number is impossible to know. Interested in more facts like the plastic waste dumped in oceans? Then plug in and subscribe to our newsletter.